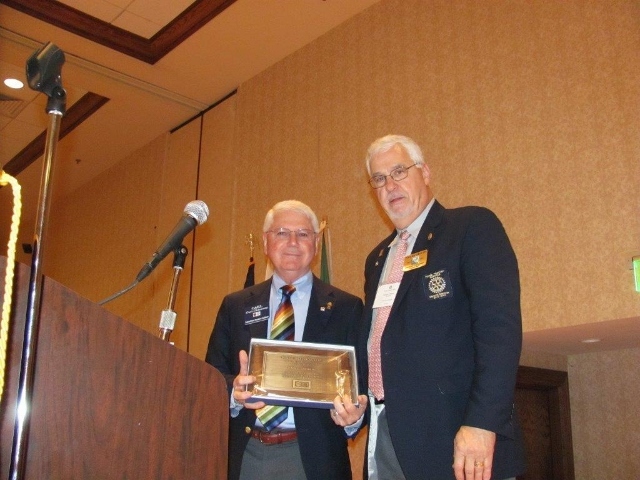 Past District Governor Carl Chinnery, a member of the Lee’s Summit Rotary Club, was nominated for and was awarded the Distinguished Service Award. This award is an internationally competitive award granted annually to a maximum off fifty Rotarians who have exhibited exceptional active service to The Rotary Foundation. To qualify for this award, Rotarians must demonstrate a broad range of service over an extended period of time. Over the past 10 years and more, Carl has served in various District 6040 Foundation Committee roles. He has chaired the D6040 Permanent Fund Committee, the PolioPlus/Polio Eradication Subcommittee of the District Foundation Committee. He is well known at the District and Zone level as the spokesman for Rotary’s PolioPlus Campaign to eradicate Polio in the world. Carl has served on the planning council of the multidistrict Missouri Show Me Rotary (PETS), and has provided exceptional leadership on Foundation Programs for incoming club Presidents, District Governors. Carl has provided Foundation programs at Zone Success Seminars, Zone Institutes, and Regional Rotary Foundation Coordinator (RRFC) Institute training sessions. In connection to the Rotary Club of Kansas City’s 100th Anniversary, Carl organized a successful Million Dollar dinner. He has worked with several Major Donors to obtain one Arch Klumph Society member and four Bequest Society members. He and his wife, Jean are Arch Klumph Society members. Carl has been a major or keynote speaker and fundraiser at more than 185 groups in 10 years, and was a speaker at the RI Convention in Montreal on polio programs. Carl currently serves as Rotary Zone 31’s RRFC, as well as being very active in his local Lee’s Summit Rotary Club.